As a baby, Buddy crawls into Santa's toy bag and is whisked off to the North Pole, where he is raised as an elf. 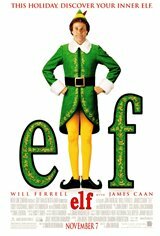 A misfit who grows to be three times the size of his elf family, Buddy ultimately heads to his birthplace of New York City to seek out his roots. Unfortunately, they turn out to be a "Scrooge"-like father and a cynical ten-year-old stepbrother who doesn't believe in Santa. Worst of all, everyone seems to have forgotten the true meaning of Christmas. But using his simple elf ways, Buddy sets out to single-handedly win over his family and save Christmas in New York, hoping to at last find his true place in the world.